Pour lemonade into a small saucepan, and sprinkle with gelatin. Allow to soak for a minute or two. Heat over low, stirring constantly, until the gelatin is dissolved (about 5 minutes). Remove from heat, stir in the vodka and sweetened condensed milk. Spoon 3/4 teaspoon of the red gelatin mixture into the muffin pan cavities. Refrigerate until set, but still sticky when touched. (The first layer will take 10 minutes or so, subsequent layers less, about 5 minutes each.) Repeat with remaining colors. Refrigerate overnight to allow the layers to fully bond. To serve, loosen around the edges of each muffin cavity and pop out the jello shots. Immediately before serving, garnish with a small dollop of frosting and sprinkles. Can't find a silicone pan? Wax-lined paper cups also work for this recipe. Just refrigerate until firm and when ready to eat, loosen by gently squeezing the cup, then simply peel away the paper cup. In a fit that I like to call creative enthusiasm (and others may call grandiose delirium), I declared August “ Cake Month” on my blog, Jelly Shot Test Kitchen. My own August birthday may have also come into play. 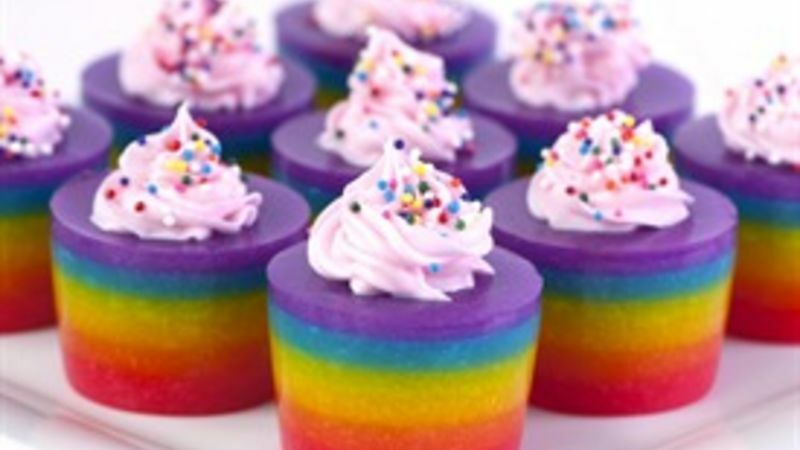 Regardless of the impetus, visions of tiny jelly shot “cakes” have been dancing in my head for weeks, so clearly I couldn’t avoid making the Double Rainbow Cake Jelly Shot! Although I’m usually a classic cocktail fan, there are times when a sweet, fun girly drink is just the ticket. As such, I’ve sustained a high level of excitement about cake-flavored vodka - the taste is unbelievably pastry-like - without adding a sticky, syrupy, gloopy texture. However, cake-flavored vodka is a fairly recent release. If it hasn’t yet made it to the shelves of your local liquor store, substitute vanilla or whipped cream flavor and just a touch of amaretto, and you’ll be on your way to confectionery perfection in no time! These little jelly shots look ornate, but are simple to make – the most important thing to remember is the timing for each layer. Let each layer chill until set, but still sticky when touched. This will ensure a firm bond – i.e. layers that hold together when the jelly shots are unmolded. (More prep details follow in the recipe instructions below.) The jelly shots are topped with a touch of frosting – a dollop of whipped cream would also be great – and, of course SPRINKLES are a must, regardless. Hope you enjoy!